Services - STIMEX® Nederland B.V. Services - STIMEX® Nederland B.V.
STIMEX® Netherlands provides the complete range of maintenance products for the camping industry. With the assortment of STIMEX® you can provide outstanding customer service to every customer. By proven quality and competitive pricing STIMEX® products are an asset to any camping, camper, boating and leisure business. 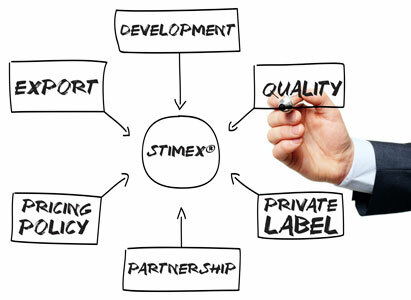 Besides our own brand and product range, STIMEX® also develops products under Private Label. We are experienced in developing products in various business areas. We provide Private Label support in product research, development, product design and packaging, until your product is ready to launch on to the market. Through 30 years of experience and continuous product development the STIMEX® products guarantee a very high quality. Due to the large production STIMEX® is able to produce high quality products at competitive prices. STIMEX® is constantly developing and expanding its range. All new products are thoroughly tested before they enter the market. STIMEX® continues to expand and is consequently looking for importers worldwide. Because almost all products are available in 27 languages, fast delivery can be guaranteed worldwide. STIMEX® holds great importance to a stable and lasting relationship with its business partners. STIMEX® already serves many large customers with Private Label. STIMEX® provides support throughout the entire development process.